The Neo FreeRunner phone is the second hardware platform to take advantage of the Openmoko software stack. You can find specifications of the hardware by reviewing this introduction page and the pages in the category as shown at the bottom of this page. For basic details please see the Customer-oriented specifications. 256MB NAND Flash MCP package. White LED backlight. Required brightness is 200 NIT minimum. Max volume: 100 dB at 5 cm to assure good performance in environment. Internal Li-Ion or Li-Polymer battery is included. This battery supplies standby power to the device eliminates the rebooting of the device when local power is again reapplied. Battery is 1200 ma-hr. Estimated current draw for the entire device when in suspend mode (and ALL peripherals are turned off or set for deep sleep) is <5 mA at 3.6 volts (Li-Ion terminal voltage). Battery will reach half capacity (~600 mAh) with 500 charge-discharge cycles. This will occur in less than 2 years of daily service. When powered continuously, Neo1973 must suspend (to low power mode) based either on observed low battery voltage condition or a configurable time delay. Neo1973 must monitor battery status while suspended and resume automatically if the charger is inserted. One micro-SD card reader, compatible with SD and SDHC. A small speed test can be found on the StorageSpeed page. Weight: ~133 grams with battery. The product is designed to last a minimum of 2 years. A NXP PCF50633 04 N3 is used for power management. Connected to: S3C2442 via I2C, client address is 0x08. 16MBit ST M58WR016KB706E NOR flash for 'unbrickable emergency boot' feature. The GSM (including GPRS) modem is Texas Instruments Calypso based and supports 2.5G tri-band GPRS/GSM. The two available models support either the 850/1800/1900 MHz bands (suitable for USA), or 900/1800/1900 MHz band (suitable for rest of the world). Unfortunately we cannot provide many details on the GSM chipset due to very tight NDAs. However, this is not neccessarily required, since it interfaces using a standard UART serial line with the S3C2442. On that interface, GSM 07.05, GSM 07.10 and other standardized protocols are used. The NDAd documentation for the calypso, register definition and hardware definition was leaked onto a public forum on the 4th of March by persons or persons unknown. The legality of reading these files may vary according to your local laws, as may generating code from them. It should support SDHC, and 16GB card has been tested. MicroSD slot is under battery. 8 Gb Transcend microSDHC class 4 card confirmed working on GTA02 (using #1743). Toppoly (tpo) 2.8" diagonal (1.7" x 2.27" - 43mm x 58mm) 480x640 TD028TTEC1 module, using a Toshiba JBT6K74 TFT LCD Driver Chipset. It should also be possible to use host mode with externally-provided power. This will allow the FreeRunner to be connected to a USB device and be powered and charging the battery if present at the same time. This method is called the Y-cable and was invented by Joerg Reisenweber. 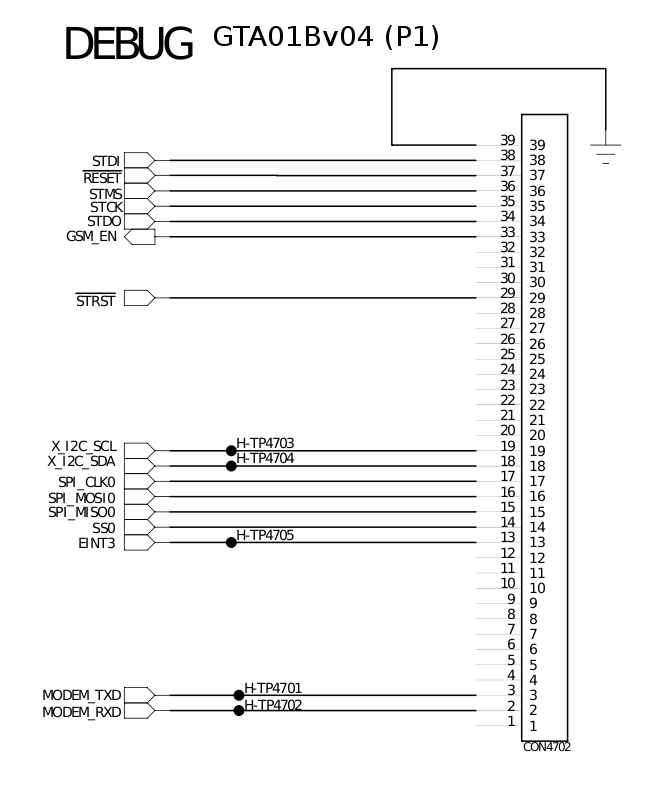 For additional info and circuit diagrams see Specialized USB Cables. If your power source was not the Openmoko 1A charger, additionally connect a 47K ohm 5% resistor between the ID pin and ground to pretend to be the 1A charger. In addition you need to make sure EN_USBHOST signal that enables the physical Host mode power generation and disables the USB -> PMU charging path is deasserted. This may be taken care of automatically shortly by detection of the 48K resistor on a USB insertion leading to forcing EN_USBHOST deasserted. The charge pump that generates the 5V in host mode doesn't seem to mind getting external 5V given to it, but the real issue is that the battery will not be charged at all if we leave EN_USBHOST asserted since one of its jobs is to stop that happening. I2C is a simple communication standard intended to move small amounts of data a few inches between chips. Please see Neo I2C Devices for more information & a list of devices & the addresses currently in use & documented for the Neo1973. The headsets used by Motorola smartphones (A780,A1200, ...) and the V-360 have a compatible configuration, as does the headset for an LG muziq 570. The case for the FreeRunner is all black, as seen on the front page of the wiki. Openmoko has released the CAD files for the case of the Neo1973 and Neo FreeRunner. These were created using Pro/ENGINEER (also called Pro/E). They are available in the Pro/E (.asm/.prt) format, but alternative formats are also available. The Neo FreeRunner (GTA02) Battery is mechanically and electrically compatible with the Neo1973 GTA01 Battery, as well as limited compatibility with a Nokia BL6C battery. According to this post on the mailinglist. Photo of the battery inside the Neo1973. This is the connector used to connect the Debug Board and possibly other hardware. The U-Boot reads the hardware revision from the PCB. The kernel reads the hardware revision from the PCB. This page was last modified on 10 February 2012, at 08:44. This page has been accessed 533,288 times.